To love Boston or to laugh at Boston—it all depends on whether or not you are a Bostonian. Perhaps the happiest attitude—and the most intelligent—is tinged with both amusement and affection: amusement at the undeviating ceremonial of baked beans on Saturday night and fish balls on Sunday morning; at the Boston bag (not so ubiquitous now as formerly); at the indefatigable consumption of lectures; at the Bostonese pronunciation; affection for the honorable traditions, noble buildings, distinguished men and women. Boston is an old city—one must remember that it was settled almost three centuries ago—and old cities, like old people, become tenacious of their idiosyncrasies, admitting their inconsistencies and prejudices with complacency, wisely aware that age has bestowed on them a special value, which is automatically increased with the passage of time. To tell the story of an old city is like cutting down through the various layers of a fruity layer cake. When you turn the slice over, you see that every piece is a cross-section. So almost every locality and phase of this venerable metropolis could be studied, and really should be studied, according to its historical strata: Colonial, Provincial, Revolutionary, economic, and literary. All of these periods have piled up their associations one upon the other, and all of them must be somewhat understood if one would sincerely comprehend what has aptly been called not a city, but a "state of mind." It is as impossible for the casual sojourner to grasp the significance of the multifarious historical and literary events which have transpired here as for a few pages to outline them. Wherever one stands in Boston suggests the church of San Clemente in Rome, where, you remember, there are three churches built one upon the other. 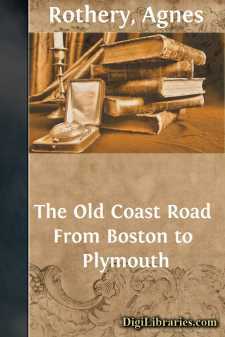 However, those who would take the lovely journey from Boston to Plymouth needs must make some survey, no matter how superficial, of their starting-place. And perhaps the best spot from which to begin is the Common. This pleasantly rolling expanse, which was set aside as long ago as 1640, with the decree that "there shall be no land granted either for houseplott or garden out of y^e open land or common field," has been unbrokenly maintained ever since, and as far as acreage goes (it approximates fifty acres) could still fulfill its original use of pasturing cows, a practice which was continued until 1830. It was here that John Hancock's cattle grazed—he who lived in such magnificence on the hill, and in whose side yard the State House was built—and once, when preparations for an official banquet were halted by shortage of milk, tradition has it that he ordered his servants to hasten out on the Common and milk every cow there, regardless of ownership. Tradition also tells us that the little boy Ralph Waldo Emerson tended his mother's cow here; and finally both traditions and existing law declare that yonder one-story building opening upon Mount Vernon Street, and possessing an oddly wide door, must forever keep that door of sufficient width to let the cows pass through to the Common.